THE Ministry of Education announced yesterday an overhaul of a system that recognises students' efforts in co-curricular programmes. The new framework, which starts with Secondary 1 students this year, will reward those who strive to be all-rounders. Students now in Sec 2 to 5 will continue with the current system until 2017. Students who do well in co-curricular programmes chalk up points that will help in their application to junior colleges and polytechnics. 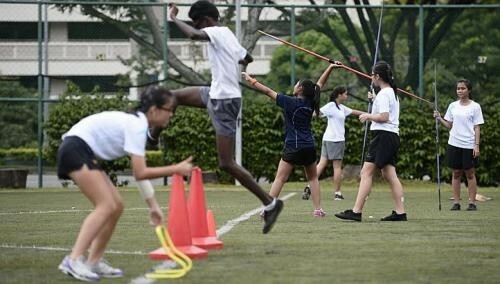 Under the new system, students like star athletes who win medals for their schools but are not as active in community service projects may not do as well. Conversely, students who are involved in a broad range of programmes - from co-curricular activity (CCA) to community service projects like planning a beach clean-up - may fare better. The new framework, called Leaps 2.0, enables students to be better recognised and encourages schools to design more "balanced" experiences, said Madam Liew Wei Li, director of student development curriculum division at the ministry. The ministry will do away with grades like A1 and replace them with three bands - Excellent, Good and Fair. The "Excellent" band will be the equivalent of the current A1 or A2 grades, which allow students to deduct two bonus points from their aggregate scores when they apply to a junior college or polytechnic. Under the current grading scheme, which was introduced in 2003, students obtain an A1 grade when they chalk up 25 points or more across five areas - leadership, enrichment, achievement, participation and service, or Leaps for short - during their secondary school years. More weight is given to leadership and achievement, such as winning medals in competitions. For example, a student can chalk up a maximum of 12 points for leadership, which takes into account positions he holds, such as school prefect or team captain. Less emphasis is given to community service, which is allocated a maximum of five points. The revised framework, however, gives equal weighting to all categories. In line with the new approach, "levels of attainment", from 1 to 5, will replace the point system. To get "Excellent", a student would need to obtain at least a level 4 in one area, and a level 3 in the rest. Enrichment, which refers to involvement in programmes like life skills workshops, will no longer contribute to a student's final band. Under the current scheme, 60 per cent of students on average do well enough to deduct the two bonus points from their academic scores. This will remain largely the same under the revised framework, said the ministry. The new system also adopts a broader criteria for some of the categories. For instance, achievements outside of school will be counted. This could include helping at a community club. The time and effort taken to plan community service projects will also be taken into consideration. Bowen Secondary principal Bernard Chew said he is glad the new system reinforces the importance of service. "It is not enough to do well in examinations and CCAs... but we must teach students equally to do good... and develop empathy, compassion and gratitude." Mr Ivan Lee, 51, a trainer who has two daughters in Bowen Secondary, said the updated scheme will help students develop character. "CCAs now are about going for competitions and winning, but they miss out on other things like serving others and reaching out."